Almost wordless: Canada Thistle is still blooming long after other flowers have faded away. 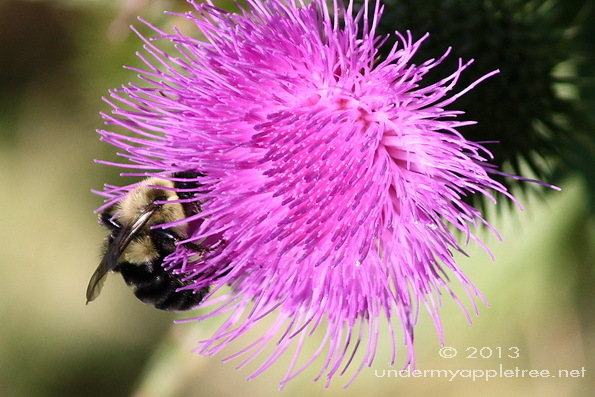 It’s an invasive, noxious weed in most of North America but the bees are happy to feed on it. I think it’s gorgeous even though it’s a weed. Fabulous “action shot”! The thistle color is very gorgeous. the bees are happy to pose as well. It’s still pretty, even if it is a weed. I think it’s the most beautiful weed I’ve ever seen!! Great shot of the bee! I like thistles! Nice shot.